WOW! If I had to sum up Tourna Big Hitter Rough tennis strings in word, it would be just that…WOW! I’m sure you can imagine my skepticism about a string from Tourna, after all, they are well known for their overgrips – “the blue grip that never slips.” So who am I to know if their strings are any good? I wanted to play test the Tourna Big Hitter Rough tennis string mostly because it’s relatively new to the market and there really aren’t many reviews on it, oh and because the price is just right, $7.95! I strung the Big Hitter Rough on my Donnay X Dark Red 94 at 60 pounds. I have to admit, I did a quick string job…I was running late to my hitting session. In any event, stringing the Big Hitter Rough was really simple and quick. Because this is a softer polyester tennis string, I didn’t find that the string coiled much, so it made weaving easy and manageable. After my warm up, I was pretty much in the middle of the road with the Big Hitter Rough, I mean, they were very soft but I wasn’t finding that I was able to get the spin that I would expect from a “textured” string. That is, until I picked it up the second time around…WOW!!! The Big Hitter is the string to have! On the second day of having these strings in my stick, I found that it had loosened up just a bit and that’s when the true potential of this string shined. I was blown away by the playability of these monofilament strings! Because this string is so soft, I was able to take full cuts without having to worry about injuring my shoulder. Not only is the Tourna string soft, the the Big Hitter Rough is plenty powerful, almost too powerful (is there such a thing? ), ball pocketing felt amazing as the ball rocketed off the string bed, it’s something that you will have to experience yourself. When it came to spin, honestly, it lacked. It did not produce what I was hoping for in terms of kick off the ground, but spinning balls is available. Though the reality is, the Tourna Big Hitter Rough tennis string provides enough power and control for you to hit deep penetrating ground strokes that you don’t necessarily need spin to be an offensive weapon. Is the Tourna Big Hitter Rough a durable string? Sorta…it hasn’t broken on me, even after heavy hitting for 7 hours (3 different sessions), but I have lost significant tension and the mains are moving around like crazy – which is OK since I have a String Thing! But as the strings loosen, there is still plenty of power and comfort, so that’s a solid plus! 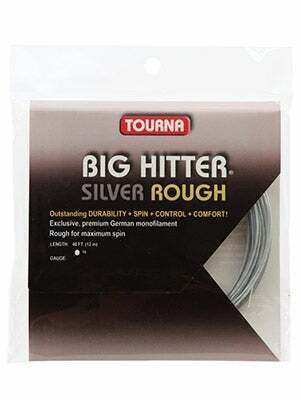 My conclusion of the Tourna Big Hitter Rough is, that it is a wonderful polyester tennis string! I absolutely love this string! It’s powerful, comfortable, durable, and more importantly cheap (not in quality though). I highly recommend this string for the power player, players looking for comfort, and the tennis player who’s on a budget. Also, I highly recommend to string the Big Hitter Rough about 5 pounds less than what you usually do, trust me, you’ll love it!